True-confession time: Sometimes even a tireless fashion editor needs a nap. This is why I was facedown in a pool of pillow Monday night, while Black Panther had its “red carpet” premiere at the Dolby Theatre in Hollywood. No, I’m not proud, but I am better rested. These posts don’t write themselves, y’all. But every so often, you wake to a reality better than anything you could possibly be dreaming of; which is exactly what it felt like waking up to the royal AF purple carpet rolled out for the cast of the most anticipated film of our year. 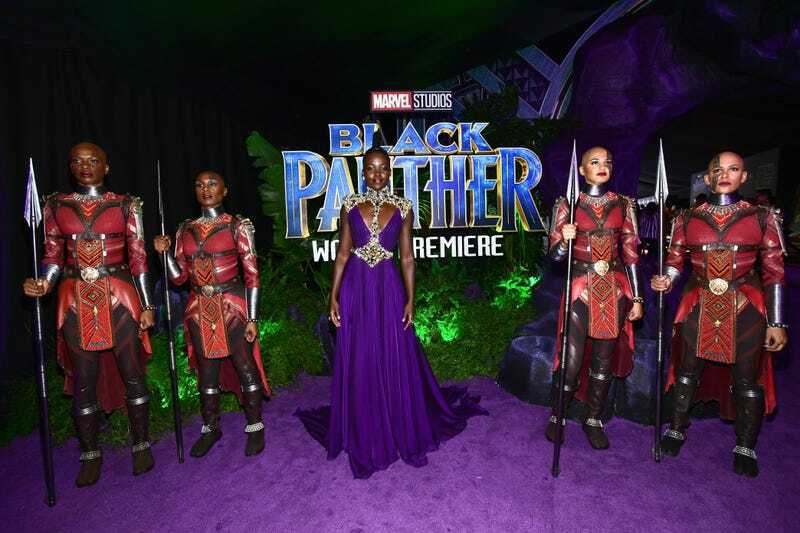 And now I’m rethinking my wardrobing choices for opening night Feb. 16, because while my body is ready, after looking at Lupita and the Dora Milaje-clad actresses, I’m clearly not well-dressed enough for Wakanda. Not yet, at least. Come through, black royalty! From director Ryan Coogler and his wife, Zinzi Evans, to a fringe-laden Angela Bassett—who reminded us that black women invented the color yellow (at least according to our intrepid weekend social media editor, Corey Townsend)—the Black Panther cast and crew showed up and showed out Monday night. Frankly, this looked like the family reunion we all wanted to attend. We are entirely here for it—and hope you are, too. Thankfully, we still have over two weeks left to get our outfits up to code before the official premiere for the general public Feb. 16; because according to our slideshow, Wakandans are clearly the new #SquadGoals!